There is a faulty analysis done when analysts look at earnings beats versus misses instead of changes to guidance. However, this isn’t the case with this chart because it includes all companies. We’ve seen strong growth in Q4 as we will review, but estimates are dropping rapidly. You wouldn’t expect stocks to rally with crashing estimates. We will review catalysts for this rally later in this article. First, let’s review the earnings reports that investors are loving the most since 2009. As you can see from the chart below, with 281 firms reporting results, EPS growth is 17.82% which is way below the last 3 quarters which had above 27% growth partially because of the tax cut. To be fair, the 2-year growth stack hasn’t fallen much as this quarter is dealing with tougher comparisons. The 2-year growth stack was 39.39% last quarter and it is 34.37% this quarter. Sales growth similarly fell as it has a 6 handle now unlike the double-digit growth of the last 3 quarters. The 2-year stack has fallen from 17.46% to 16.65%. That’s a relatively minor slowdown. It makes the data look better. 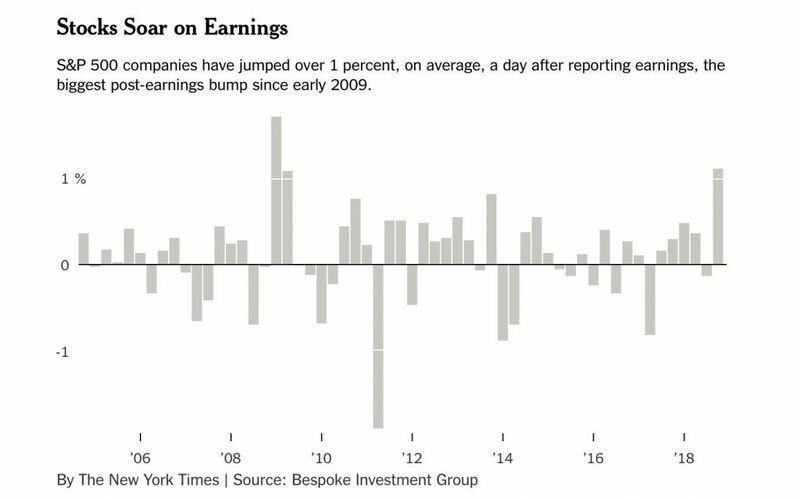 Since this chart has been published 9 firms have reported earnings, which has pushed EPS growth up to 17.9% and sales growth down to 6.8%. 70% of firms have beaten EPS growth and 62% have beaten sales estimates.